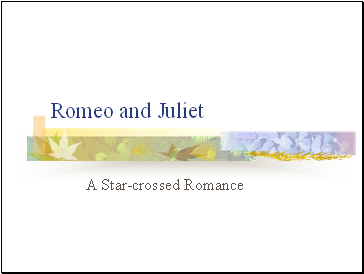 Romeo and Juliet was written by Shakespeare in 1594 or 1595. 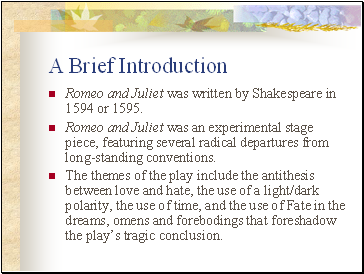 Romeo and Juliet was an experimental stage piece, featuring several radical departures from long-standing conventions. The themes of the play include the antithesis between love and hate, the use of a light/dark polarity, the use of time, and the use of Fate in the dreams, omens and forebodings that foreshadow the play’s tragic conclusion. 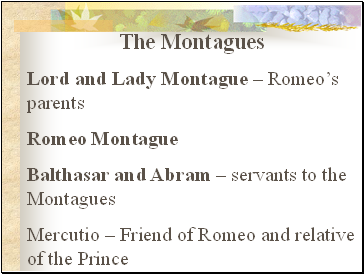 Act I – Shakespeare establishes an on-going feud between two families, the Montagues and Capulets. 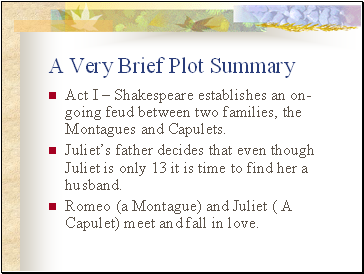 Juliet’s father decides that even though Juliet is only 13 it is time to find her a husband. Romeo (a Montague) and Juliet ( A Capulet) meet and fall in love. Act II – One of the Capulets challenges Romeo to a duel. Romeo’s friends fear for his safety. Friar Laurence conspires with Romeo to arrange a secret marriage. 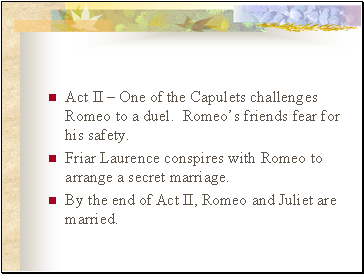 By the end of Act II, Romeo and Juliet are married. 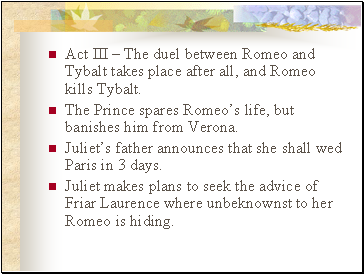 Act III – The duel between Romeo and Tybalt takes place after all, and Romeo kills Tybalt. The Prince spares Romeo’s life, but banishes him from Verona. 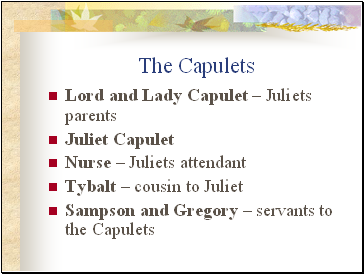 Juliet’s father announces that she shall wed Paris in 3 days. Juliet makes plans to seek the advice of Friar Laurence where unbeknownst to her Romeo is hiding. 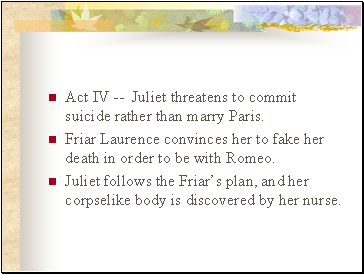 Act IV -- Juliet threatens to commit suicide rather than marry Paris. Friar Laurence convinces her to fake her death in order to be with Romeo. Juliet follows the Friar’s plan, and her corpselike body is discovered by her nurse. Act V – Romeo receives word that Juliet is dead. 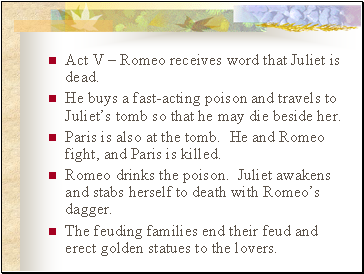 He buys a fast-acting poison and travels to Juliet’s tomb so that he may die beside her.